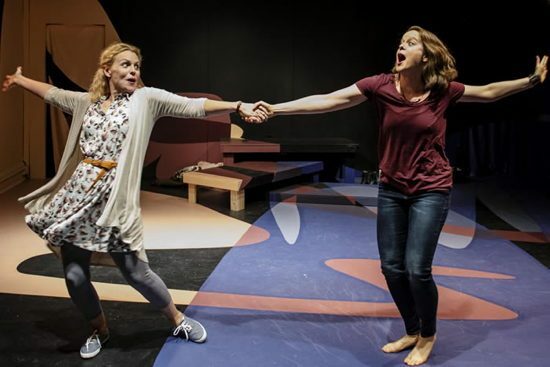 Tonya Beckman as Susie (L), and Esther Williamson as Jude (R), in Sadie Hasler’s Pramkicker. Photo by Teresa Castracane. “Pramkicker,” now being produced by the Taffety Punk Theatre Company, is a scintillating kick of a story about love, the life choices society so graciously tries to truss women up in, and building the strength and courage to steer one’s own course, without apology. What struck me most about this show, besides the hysterical treatment of do childless women have any real currency in modern Western society (and the lengths women often go to justify their existence), was the level of love and acceptance between the two sisters. They may have issues, might have some secrets and old resentments, maybe drink a bit too much gin sometimes, but at bedrock, these two have each other’s backs. That we should all be so lucky. Don’t miss “Pramkicker.” It’s witty and funny and serious and gives one hope for surviving what life throws at us…. Tonya Beckman as Susie and Esther Williamson as Jude are perfect as the two sisters (and some other characters, too). These sisters have a level of honesty and individuality that makes you want to be a neighbor, just to be included in their world even a little bit. They are also funny. Off-the-wall funny, but it’s all so matter-of-fact that you just accept their worldview. Jude has kicked a pram (well, it WAS empty) and gotten into a brawl (there was a headlock involved) with a self-righteous “mom” (and she did touch Jude without permission first) who wears her motherhood like a badge of superiority that demands the rest of the world give way to her, because she’s a “mother.” She has society’s stamp of approval. She and her huge pram got between the coffee and Jude at the local coffee shop, and well, some mayhem ensued. So, to avoid charges, Jude has to go to anger management classes, and her sister Susie comes along as both moral support and to make sure she follows through on attendance. Both sisters are living in their parent’s old house (said parents having scampered off as soon as they retired), and as Jude is actually making money while Susie resets her life, well, it’s important on several levels that Jude not be charged and end up in jail. During the course of a very brisk 70 minutes, as the sisters go through these anger management classes, we also get glimpses of their lives, past and present. Along the way, we meet the woman whose pram was kicked into the street (Beckman does hysterical double duty there as the mom) and witness their surprisingly muscular fight. We also get to meet a couple of other people in the class, as well as Jude’s ex (also played by Beckman) who managed to ignite the fuse on some secrets and some resentments—and that just might have started the whole thing. The staging is delightfully immersive, as there is a row of seats stage right and stage left where audience members fill in, in a sense, for the anger management group. With the swift change of a jacket or sweater, Beckman and Williamson morph into another character, whether male or female. A slight change in stance or walk, a few fluttering hand gestures, and they utterly transform. There is also a lovely bit between scenes when as the actresses pass each other, they grab arms and swing each other around; it cements the bond they share even when they don’t really understand each other. “Pramkicker” was written by Sadie Hasler; directed by Linda Lombardi, and the spare but effective set designed by Kate Fleming. The writing is so deft and the interpretation by the creative team so deceptively simple that you can just picture in your imagination the crowded, drizzled streets, the steamy warmth of the coffee shop with that slightly burnt odor, and just everything. Don’t miss “Pramkicker.” It’s witty and funny and serious and gives one hope for surviving what life throws at us; now if only we had these sisters to lean on occasionally. Running Time: About 70 minutes with no intermission. Advisory: Strong language; adult topics. “Pramkicker” runs from September 12-29, 2018 at the Capitol Hill Arts Workshop, Washington, DC. For more information, please click here.